There is a mobile app (iPolis) which Samsung have released to interface with these CCTV units from iOS and Android devices. However, the desktop (web) application is somewhat dated. This web application requires a number of plugins which means it only works on Windows devices (7/10 etc) and not on Mac OS X. The mobile app is configured to use a RTSP stream. This got my thinking, could I connect direct to the stream from a “normal” desktop application such as VLC media player? Samsung has the following article on their support pages detailing the RTSP format used. After a little bit of testing, I managed to get the stream to work on my Mac OS X desktop. The above values are the default for the Samsung SRD-442 unit. Clearly you need to ensure your SRD-442 unit is on the network and (if applicable) you have opened the firewall ports into your network for RTSP. In my example, the string I have used is as follows. This shows the second camera input on the SRD-442 (password and hostname changed for security). 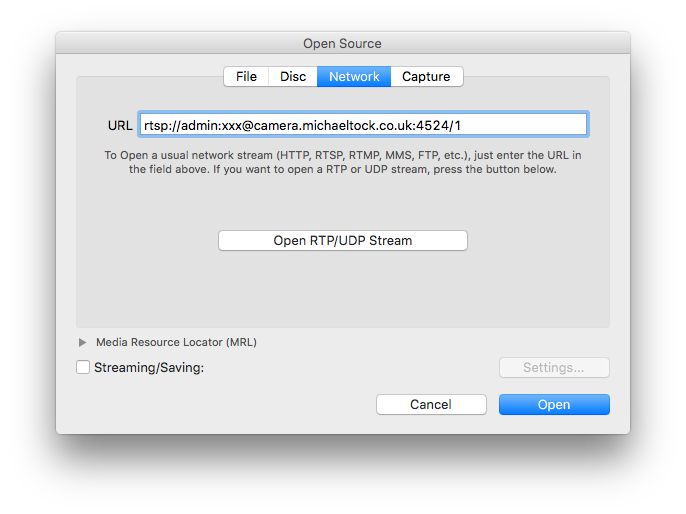 Finally, open up VLC and select File -> Open Network and enter the stream details.